It has been a long time coming! 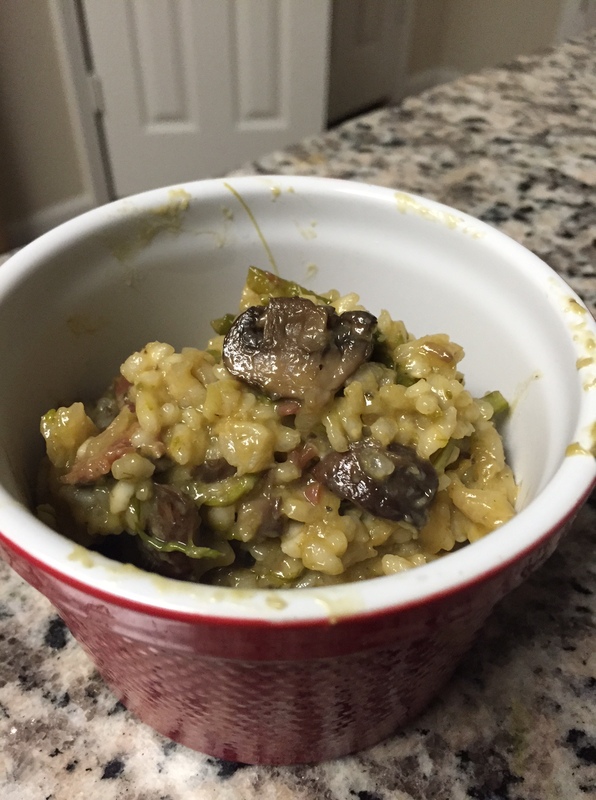 I have been craving risotto this whole winter season. (Yes, even though it’s march, I am still going to call it winter because we just had ~2 feet of snow last week) I had been searching through different recipes all last week (Praise, food blogs) to get inspiration for my original recipe. Most recipes I found used heavy cream…which I am not a big fan of (high fat) so I was kinda not feeling it anymore until my mom told me that it wasn’t supposed to be made with cream. 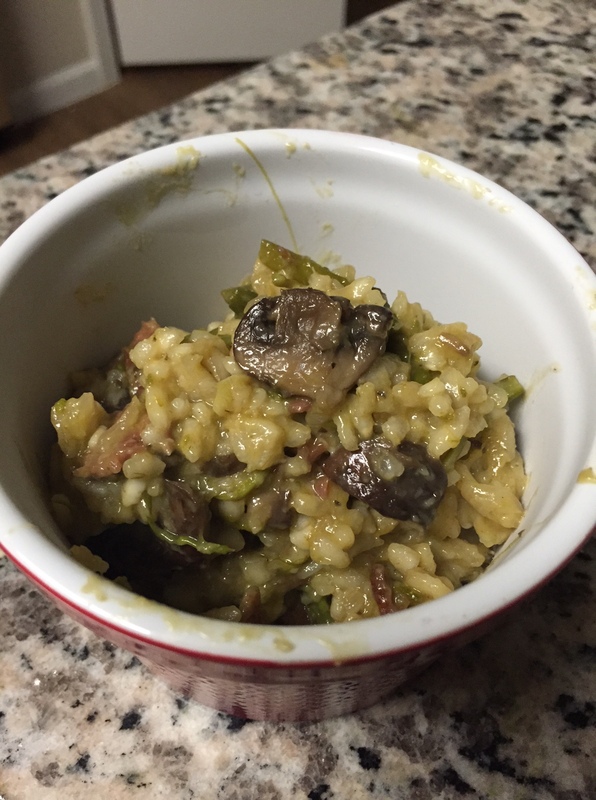 Turns out, it is the combination of the chicken broth and the arborio rice that creates the creamy consistency without any addition of heavy cream. I don’t mean to toot my own horn, but wow this turned out WAY better than I ever could have imagined. I got a little creative and added my own touch :) This meal is perfectly creamy and full of flavor! 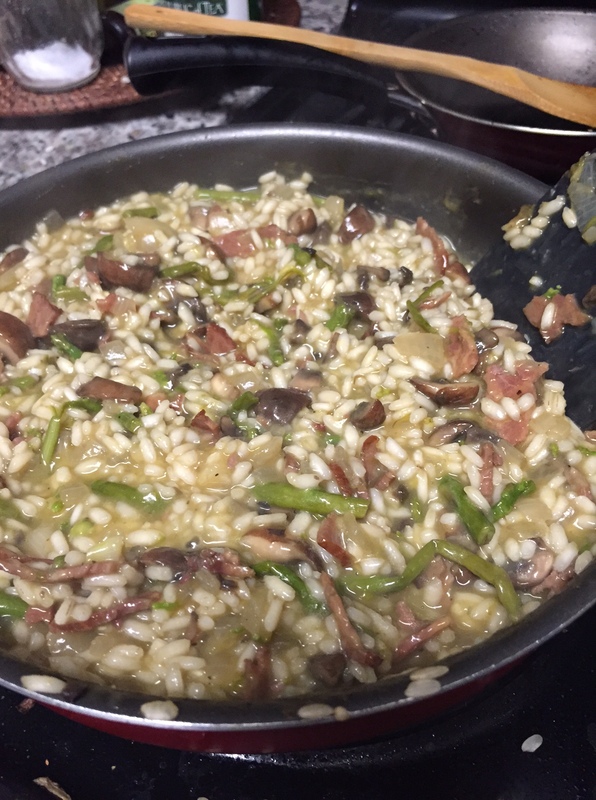 Not going to lie, the process of making the risotto is a little time consuming but trust me, the end result is SO worth it! Start by boiling the five cups of chicken broth in a pot on medium heat. 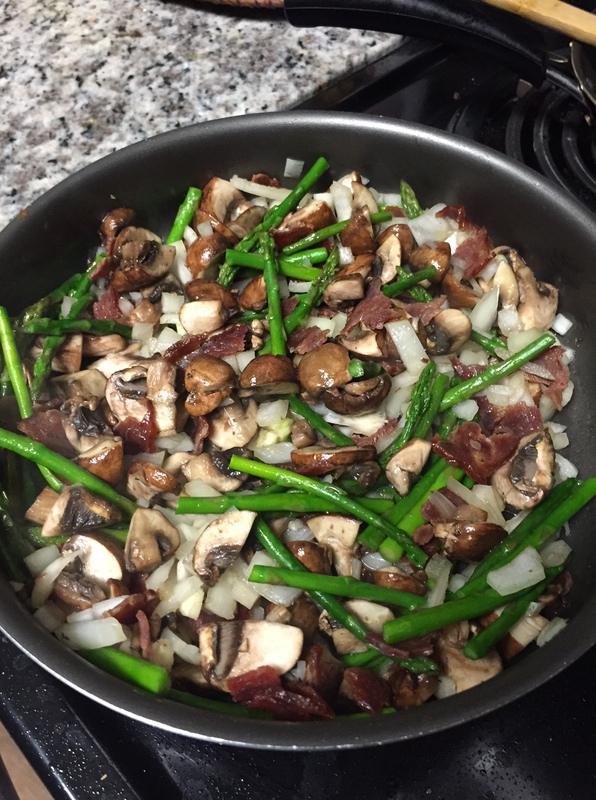 At the same time, saute the mushrooms, asparagus, garlic, onions, and (turkey) bacon together in a skillet. Use a tiny bit of EVOO, if necessary. Once the chicken broth is brought to a boil…turn it down to low heat and let it simmer. Continue to saute the veggies + bacon until they start browning and become tender. Once tender: add the cup of rice to the veggie mixture and cook for a few minutes (3-5) slowly, add in the white wine while continuing to stir. Wait for it to fully absorb, then add about half of the 5 cups of chicken broth and stir continuously until fully absorbed. The more you continue to stir, you will see the rice absorbing the liquid and obtaining a creamier texture. Add the other half of the broth and stir until absorbed. Put the top on the skillet and let it sit on low heat for 5 minutes to fully soak up any excess liquid. Finally, take the skillet off the heat and stir in about a ~1/2 cup of any kind of cheese you’d like and season with salt and pepper. I used the three cheese blend from Trader Joe’s! Enjoy!!! Serve with white wine to obtain optimal taste and enjoyment ;) I hope you all enjoy this as much as I did…See you all Thursday! This looks fabulous! Keep them coming kab!!! ← No Bake Coconut Bars!